Congratulations to Rex and Devera Miller of Agri-Tech Design. We know you’ll love what this boy can do. Sparrow MF represents an intentionally sought after extension to our Polish-focused program. 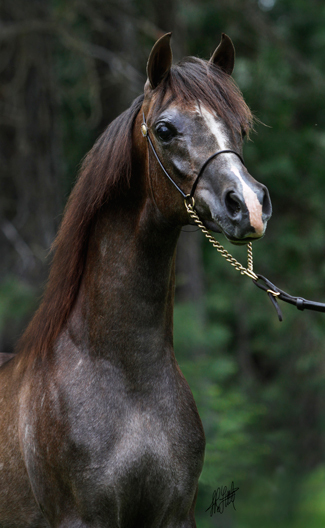 His sire, international Champion *El Nabila B, brings Russian and Crabbet lines into play and contributes his large, luminous, piercing black eyes, dry desert look, and powerful structure. His dam is by the fabulous Echo Magnifficoo and out of a Benraz++// daughter; she is double Gamaar bred. Every line of Sparrow’s pedigree contributes an attribute we wish to pass on, and he IS his pedigree. You see in his flesh what his blood dictates. An elegant young colt, growing proportionately and correctly, he earned a Region IV Reserve Championship in the Breeders Sweepstakes Yearling Colt division. He is carrying a bit now and going well in the lines. His kind, easy going and confident disposition is a pleasure to be around. Sparrow is a Breeders Sweepstakes entry.